Atlantic Pump offers a wide variety of industrial strainers engineered and manufactured by Tate Andale. These filters and strainers are manufactured from heavy duty castings to create long-lasting, thick walled simplex, duplex, and self cleaning strainers. 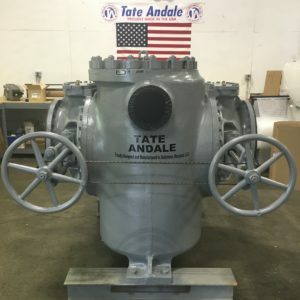 As a factory-trained distributor stocking Tate Andale products, Atlantic Pump can meet your needs for local inventory or support for Tate Andale strainers. Tate Andale has been a premier producer of fluid-control equipment since 1924, designing and manufacturing an array of products including their renowned heavy duty industrial strainers and filters. As a U.S. based manufacturer, Tate Andale sources all castings from U.S. foundries and performs all machining, assembly, and testing in Baltimore. Atlantic Pump distributes Tate Andale strainers throughout Maine. Atlantic Pump has factory authorized maintenance facilities for Tate Andale products. 1050 Single Basket Industrial Strainers are customizable, featuring a flanged body with a single side-entry perforated steel basket that can be removed for easy cleaning. A clearance of 0.5” between the body housing and basket frame allows easy removal, although particles as large as 0.5” may bypass the basket. Available in fabricated steel, stainless steel, and exotic alloys. 1060 Offset Single Basket Industrial Strainer/Filter provides a custom solution in a simplex strainer. Sized from 4” to 42”, and fabricated in any material from carbon steel or stainless steel to any number of exotic alloys, this strainer/filter can also be customized with a fusion-based epoxy coating to create a solution for filtering nearly any fluid. IS Simplex-Single Basket Industrial Strainers are rugged, heavy duty industrial strainer for severe operating conditions that require carbon steel, stainless steel, or bronze construction. Extra heavy body walls guarantee high corrosion allowance and longevity. High open area ratios lower maintenance requirements. Designed for in-line cleaning with a quick-opening cover that cuts maintenance time and costs. The outstanding longevity plus low operating costs mean the lowest life cycle cost available. 105 Simplex-Single Basket Industrial Strainers have universal application wherever fluid flow can be stopped temporarily for removing and cleaning the basket. Available in sizes 6″ through 30″, system pressure up to 150 PSIG. The basket access cover for 6″ through 16″ is yoke type; 20″ through 30″ is swing bolted. The strainers with side entry baskets incorporate .05″ clearance between the body housing and basket frame to facilitate basket removal. While the basket can be lined with a mesh liner, particles as large as .05″ may bypass the basket. R and S Twin Basket Industrial Strainers feature cast iron bodies with a low profile. Straining baskets are mounted parallel to the pipeline with relatively straight line fluid flow through the strainer. The Model R strainers are available in sizes 4” thru 36”. The Model S features multiple baskets in each chamber, which doubles the overall basket areas of the Model R.
AL and AH Twin Basket Industrial Strainers range in inlet diameter size from 4” to 24” and are manufactured from cast iron. Sliding gate valves are the only moving parts, and they feature wedge seating so there’s no contact with the body during the chamber changeover process, reducing wear and extending equipment life. The AL and the larger AH feature side entry baskets that help achieve the lowest pressure drop available, which results in the lowest operating cost. DU-200 Series Industrial Dual Strainer Systems offer the ability to meet any operating condition with a customizable fabricated duplex strainer. Options include the arrangement of inlet/outlet connections, nozzle connections, body sizing, ball valves or butterfly valves, and material choices from carbon steel to exotic alloys. Features include quick opening yoke type covers, cover lifting davits, backflushing and blowdown to reduce maintenance time and costs. ID Twin Basket Industrial Strainers are engineered from cast steel, stainless steel, or bronze. The tapered plug valve is designed to eliminate wear from the change-over process and minimize fluid bypass. The heavy duty castings provide the highest corrosion allowance and longest life of any plug-type strainer. Designed with straining ratios of up to 15:1, the Model ID delivers the lowest life-cycle cost of any plug-type strainer in the industry. 1260 Self Cleaning Automatic Strainers provide a highly efficient and reliable means of removing solids from process fluids. A bank of WEDGEWIRE straining elements designed with a unique “V” shape provide positive straining. A rotating arm, which is vented to atmosphere, isolates each WEDGEWIRE element for cleaning through an effective backwashing action without disturbing total flow. The Model 1260 self-cleaning strainer can be arranged for either continuous backwashing or intermittent backwashing and are capable of handling flow up to 32,000 USGPM and straining as fine as .0025″. KBF Self-Cleaning Automatic Industrial Strainers are customizable fabricated strainer designed for continuous backflush operation. Featuring a fabricated stainless steel backwash arm and a single, replaceable element wedgewire basket, the Model KBF is designed to be unattended for extended periods of time. The wedgewire element features a reverse groove design that prevents lodging of debris in the element, and creates a vortex for efficient backflush. Available in carbon steel, stainless steel, and exotic alloys, these strainers can be customized to handle any fluid. KB Self-Cleaning Automatic Industrial Strainers are cast iron, continuous backflushing, self-cleaning strainers with an oversized body to accommodate higher flow rates. Featuring a cast ductile iron backwash arm rotated by an electric motor, the Model KB is designed for installations which will be unattended for extended periods. Combined with a single piece stainless steel wedgewire straining element with a reverse groove design, the oversized body produces a high straining ratio. Configuration for intermittent automatic backflush also reduces effluent, and allows long periods between backflushing. KRF Self-Cleaning Automatic Industrial Strainers are customizable fabricated self-cleaning strainers designed for continuous backflush operation. Featuring a fabricated stainless steel backwash arm and a single, replaceable element wedgewire basket, the Model KRF is designed to be unattended for extended periods. The wedgewire element features a reverse groove design that prevents lodging of debris in the element and creates efficient backflush operation. The Model KRF can be constructed from carbon steel, stainless steel, or exotic alloys to handle any fluid, and can be customized for size and pressure requirements. KR Self-Cleaning Automatic Industrial Strainers are cast iron continuous backflushing self-cleaning strainers featuring a rotating stainless steel backwash arm driven by an electric motor. This strainer is designed for installations that will be unattended for extended periods. Utilizing a stainless steel wedgewire straining element, the Model KR has a high straining ratio for a normally sized industrial strainer. The KR can be configured for automatic intermittent backflushing to allow longer periods between backflushing. The wedgewire element also features a reverse wound design that prevents lodging of debris in the element. Model KR offers a rugged, durable, efficient self-cleaning strainer available for pipelines from 3”-36”. AL & AH Automatic Twin Basket Industrial Strainers feature only one set of moving parts to minimize wear. The automated sliding gate valves feature wedge seating, so there’s no contact with the body during the chamber changeover process, reducing wear and extending equipment life. Side entry baskets provide the lowest pressure drop available. CC Industrial Self-Cleaning Automatic Strainers are a simplified, efficient, automatic self-cleaning modification of the Model AL and AH design. With a strainer body that consists of consists of two chambers with open bottom basket, the Model CC is available in 4″ through 24″ sizes and may be used for operating pressures from 15 to 125 PSIG.